While our planet’s oceans are clearly facing serious health challenges these days, we’re fortunate that many marine and coastal habitats are still alive and relatively healthy. In our little corner of the world, the Salish Sea teems with life in many places, including some of the shores of Haro Strait at the southeastern end of Vancouver Island. 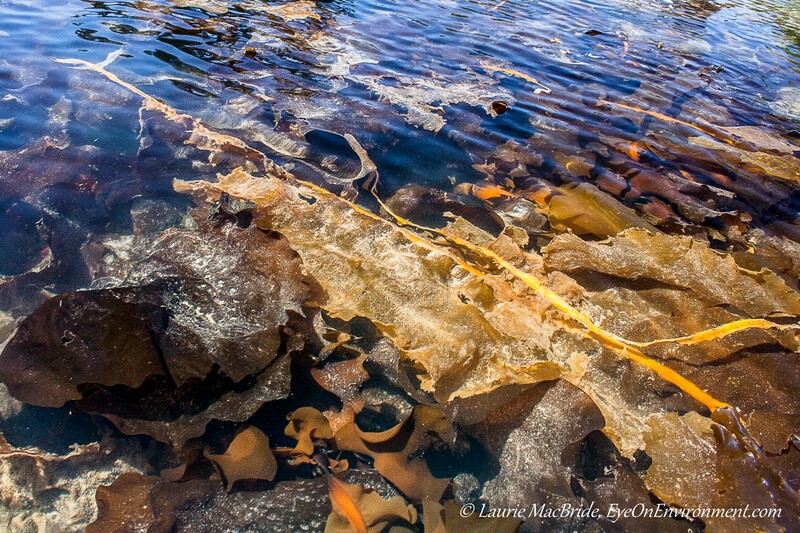 Paddling there at low tide earlier this month, so thick, rich, colourful and diverse were the kelps, seaweeds and sea grasses below us that we had the sense of floating atop a giant salad bowl. 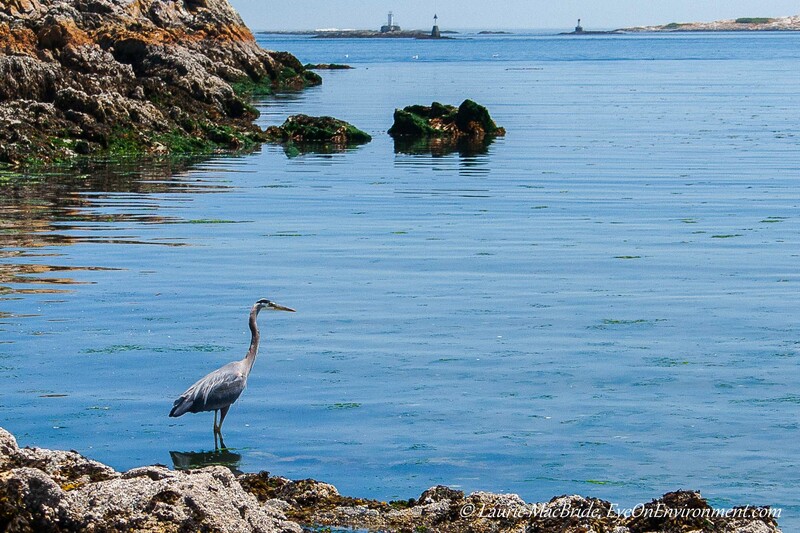 The water was dense with plankton and kelp crabs sheltered among the fronds. In a single morning’s paddle, we encountered massive schools of forage fish, large flocks of Canada geese feeding on the seaweeds, numerous Great blue herons, River otters, gulls of several species, Pigeon guillemots, Harbour seals, Bald eagles, Black oystercatchers, cormorants and more. The intertidal zone was rich with barnacles, mussels, limpets and seaweeds, and of course, there was also much life below us in the sub-tidal zone, that we were not able to see from our kayaks. Vital and alive, for sure – but these shores are also seriously threatened. If approved by Canada’s National Energy Board, Kinder Morgan’s plan to triple its existing pipeline capacity will result in a six-fold increase in massive tankers travelling in and out of Haro Strait, carrying oil from Alberta’s tar sands – about 35 tankers every month, year-round. With winter storms and gales, tide rips and currents and the already heavy marine traffic along this corridor, not to mention all the “unexpected” events that occur with ships of all sizes, accidents and major oil spills will be inevitable, and the impacts would be horrendous. That’s one of the reasons that like many people in our region, I applied to be a commenter in the National Energy Board’s review of the proposal. I have other concerns about the project as well, including the climate impacts of all that tar sands oil. I was accepted as a commenter, and I’ve now submitted my official Letter of Comment along with some photographs and other documents. If you’d like to see what I said to the Board, you’ll find links to the Letter and attachments here. My husband – who, like me, grew up on the shores of the Salish Sea – has also submitted a Letter of Comment, and it’s well worth a read. You can find the link to his letter and supporting documents here. If you’d like to know more about Kinder Morgan’s proposal, its risks, potential impacts, and how you can help, you’ll find plenty of great information here, on Georgia Strait Alliance’s site. Let’s hope the Board listens well, and heeds the pleas of the hundreds of BC residents who have been granted the right to take part in this process and are calling on the Board to reject Kinder Morgan’s proposal. In the meantime, I’ll go paddling with my fingers crossed. 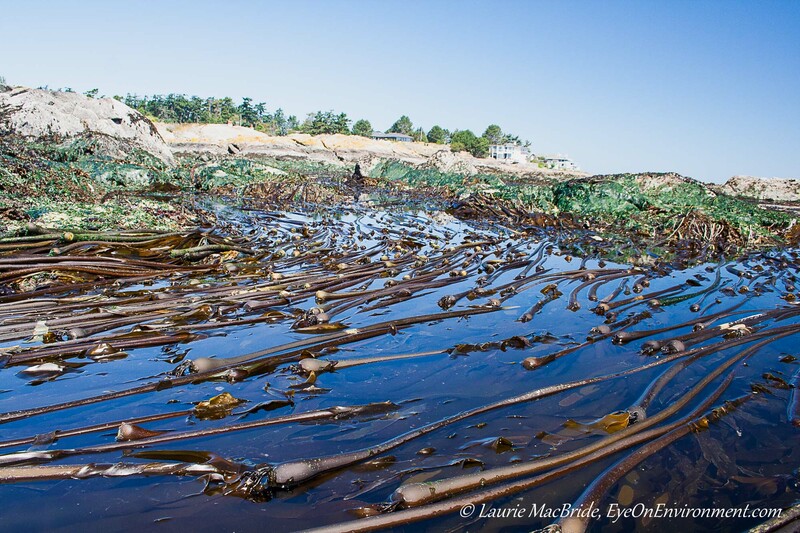 Posted by Laurie MacBride, Eye on Environment on July 14, 2015 in BC coast, Environmental issues, South Coast & Vancouver Island and tagged climate, environment, herons, kayaking, kelp, nature, ocean, oil spills, photos, shoreline. My wife and I are so very concerned with this issue, Laurie, on behalf of all of BCer’s, human and otherwise, we truly appreciate the efforts you and your husband are bringing to bear on this topic. I love the shots you’ve shared here to help make your point, and my wife and I send you our best wishes as you carry on this important fight. Thanks so much, Toad. It’s heartening to know that so many people are opposed to the Kinder Morgan pipeline expansion and all the dangerous tanker traffic it will bring to our waters. While I don’t have a lot of faith in the process, I feel like we have to give it our best shot. Let’s hope sanity prevails in the end. Laurie, I so appreciate the work you and your husband have put into this. Your love for and knowledge of the area are so valuable. You’re speaking up for the land. Thanks Sherry – we need all the support we can get on this issue!